There are 76 Assisted Living Facilities in the Milwaukie area, with 8 in Milwaukie and 68 nearby. The average cost of assisted living in Milwaukie is $4,419 per month. This is higher than the national median of $3,346. Cheaper nearby regions include Lake Oswego with an average starting cost of $3,475. To help you with your search, browse the 349 reviews below for assisted living facilities in Milwaukie. On average, consumers rate assisted living in Milwaukie 4.1 out of 5 stars. Better rated regions include Lake Oswego with an average rating of 4.4 out of 5 stars. Caring.com has helped 8 families in Milwaukie find high-quality senior care. To speak with one of our Family Advisors about assisted living options and costs in Milwaukie, call (855) 863-8283. Ask About Our Newly Reduced Rates! Limited Time Offer. * See our Sales Director for details. Milwaukie, a suburb of Portland, is all about trees — its nickname is the Dogwood City, after the beautiful flowering trees, and it's the home of the Bing cherry. Aging seniors looking for assisted living facilities in this area have eight to choose from in Milwaukie and another 83 available in neighboring cities including Portland, Tualatin and Happy Valley. Assisted living communities, which are licensed in Oregon by the Department of Human Services, provide room and board to seniors who need a little help with personal care services. These services include medication management as well as assistance with the activities of daily living, including dressing, eating and bathing. •The TriMet Transit District provides public transportation in Milwaukie, with bus service running through the entire area and half-price fares available for seniors. The Orange Line of TriMet Light Rail connects Milwaukie to Portland. •Milwaukie has an array of community resources for seniors, including the Clackamas Resource Connection, an organization that assists seniors with medical needs, health insurance issues, money management education and financial help to pay for heating bills, as well as one senior center. •Milwaukie's weather can best be described as wet, with a couple of dry months during the summer. Temperatures tend to be mild, and Milwaukie residents experience only a few days of snow per year. •Milwaukie is partially in Clackamas County and partially in Multnomah County, which is a member of the AARP Network of Age-Friendly Communities, meaning that its elected leadership “has made the commitment to actively work toward making their town, city or county a great place for people of all ages,” according to AARP. •The cost of living in Milwaukie is 27.1 percent higher than the average cost of living in the United States, which could be a concern for seniors on a fixed income. •The Milwaukie area is home to world-class medical facilities, including Providence Milwaukie Hospital, in the event of medical emergencies or illness. Assisted Living costs in Milwaukie start around $4,419 per month on average, while the nationwide average cost of assisted living is $4,000 per month, according to the latest figures from Genworth’s Cost of Care Survey. It’s important to note that assisted living rates in Milwaukie and the surrounding suburbs can vary widely based on factors such as location, the level of care needed, apartment size and the types of amenities offered at each community. Oregon's Community First Choice plan, also known as the 1915(k) plan, the K Plan and the K Option, provides long-term benefits funded by Medicaid. Eligible seniors can use this financial assistance to pay for their assisted living fees. Learn more about these programs, plus who’s eligible, on our Assisted Living in Oregon page. 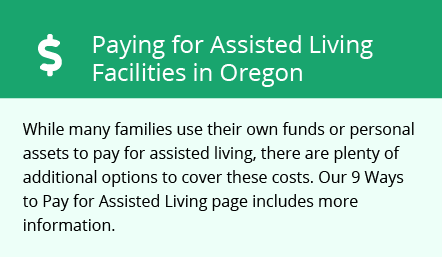 For more information about different ways to finance assisted living, visit our Assisted Living in Oregon page. Milwaukie and the surrounding area are home to numerous government agencies and non-profit organizations offering help for seniors searching for or currently residing in an assisted living community. These organizations can also provide assistance in a number of other eldercare services such as geriatric care management, elder law advice, estate planning, finding home care and health and wellness programs. To see a list of free assisted living resources in Milwaukie, please visit our Assisted Living in Oregon page. Milwaukie-area assisted living communities must adhere to the comprehensive set of state laws and regulations that all assisted living communities in Oregon are required to follow. Visit our Assisted Living in Oregon page for more information about these laws.